Antoine Tava "Warhol Screaming Heart (Blue)"
Antoine Tava "Saturday Morning - After Party"
Antoine Tava "Sunday Morning - After Party"
Antoine Tava "Keith & Mouse"
Antoine Tava "What's Up, DUCK?" Antoine Tava "Big Bad Baller (lime)"
Antoine Tava "I Want You"
Antoine Tava "Warhol Screaming Heart (yellow)"
Antoine Tava "Warhol Screaming Heart (coral)"
Antoine Tava "Screaming Heart (white)"
Antoine Tava "Screaming Heart (blue)"
Antoine Tava "Only Crooks Eat Good Soup"
Antoine Tava "King of Brooklyn"
Antoine Tava "Ludo vs. Frankie"
Antoine Tava "My Pants Are Not Too Short, I'm European"
Antoine Tava "Tintin in Fox Camouflage"
Antoine Tava "Take a Bite Out of my Cannolo"
Antoine Tava "Cool Kids (ft. Andy Warhol)"
Antoine Tava "Lek-a-Lek Me Back"
Antoine Tava "Milk & Run"
Antoine Tava "Only Crooks Eat Good Food"
Antoine Tava "A Sailors Key"
Antoine Tavaglione (aka TAVA) is a Montreal-based painter, muralist and illustrator. 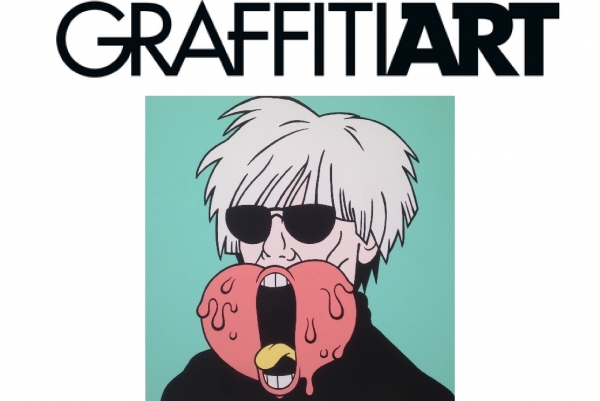 Not one to shy away from the spotlight, he has made waves with his controversial mix of Pop Art, political banter and high fashion. 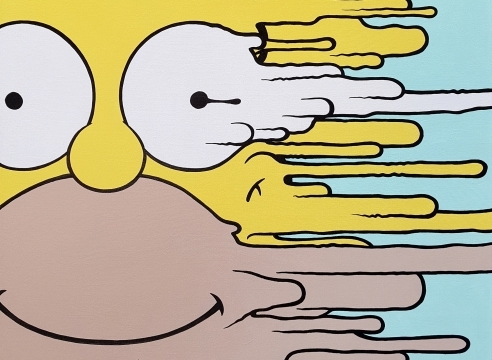 TAVA takes an omnivorous approach to both low and high culture, interacting with its symbols and cult figures through his tongue-in-cheek style and signature ‘dripping’ visual effect. Navigating between the artistic and commercial worlds, he places himself in the posterity of artists who have recognized and incorporated mercantile principles into their artistic practices. TAVA first became known for his trademark illustration the "Screaming Heart". Charged with multiple meanings, his screaming heart not only refers to heartache, but also to the emotions that are suppressed, digested and repressed. 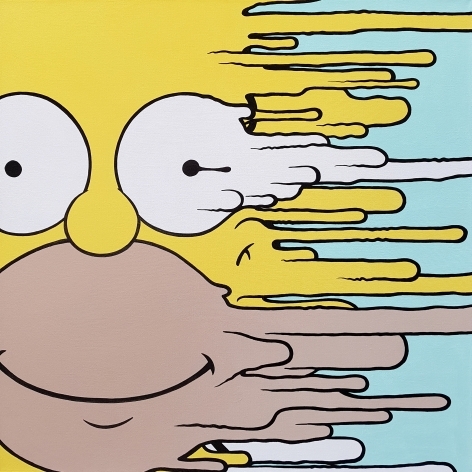 Through the staging of this figures, TAVA aims to exteriorize these paralyzing emotions by juxtaposing them with the many humorous and political references that characterize his work. 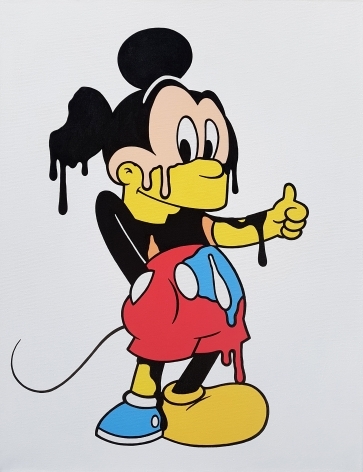 TAVA has exhibited his work in New York, Miami, Toronto, Sao Paulo, Dubaï, and Barcelona, to name a few. After acquiring his Bachelor's degree in visual arts at Concordia University, he debuted his artistic career as an art director. 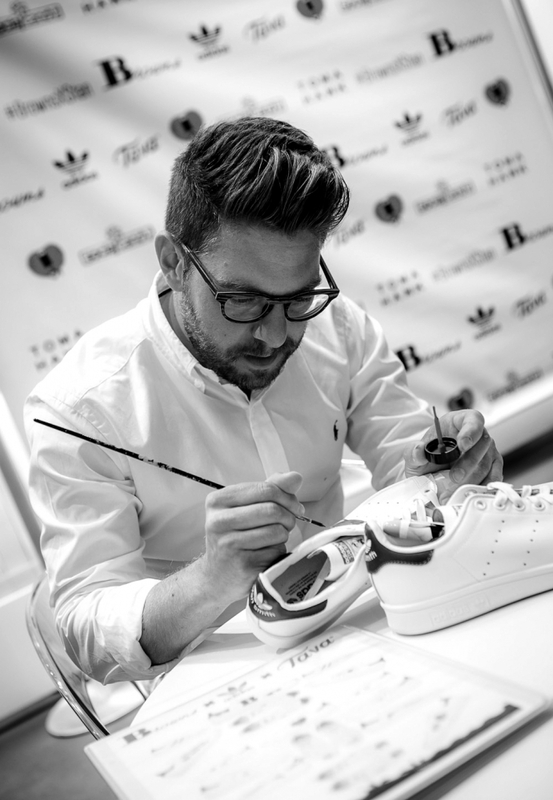 He has collaborated with numerous companies such as Adidas, Nike, Vans, Toms and Ford, and applied his own signature to products and commercial spaces. 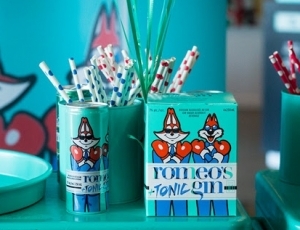 On your next visit at SAQ, you'll probably see some colourful characters on Romeo's Gin + Tonic cans. Introducing Ludo Fox and Frankie, created by Montreal urban artist Antoine Tava, they're will be your new favourite summer drink! 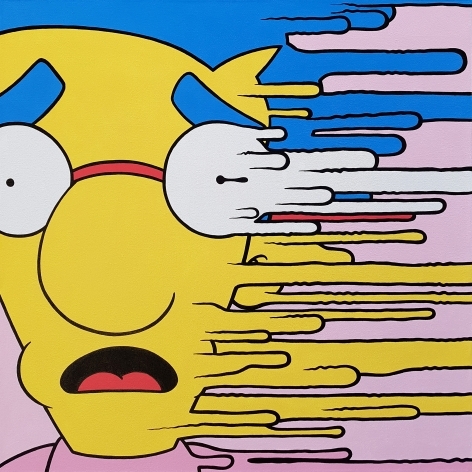 Quebecer and Italian, Antoine Tavaglione likes to integrate his origins into his pop culture-inspired works. 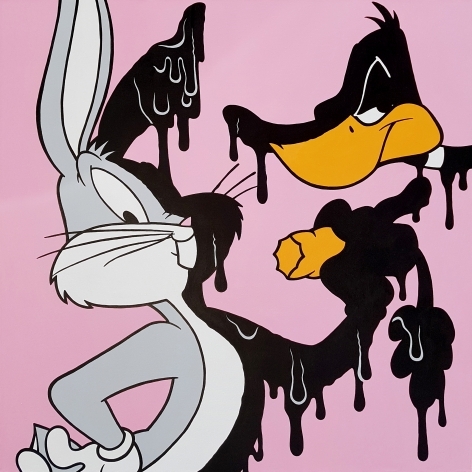 After studying animation cinema and working in a creative agency, the artist left the quietness of his office work to dedicate himself to his studio and mural production. 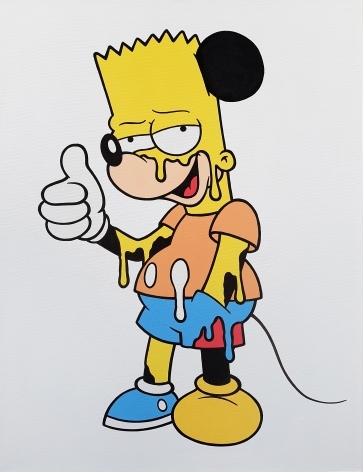 His very first exhibition in 2011 already drew attention on his unique style: symbols with sticky and dripping cartoony characters. This metaphor of the dictatorship that brought him to find his own graphic identity is however far from being a recurring theme. 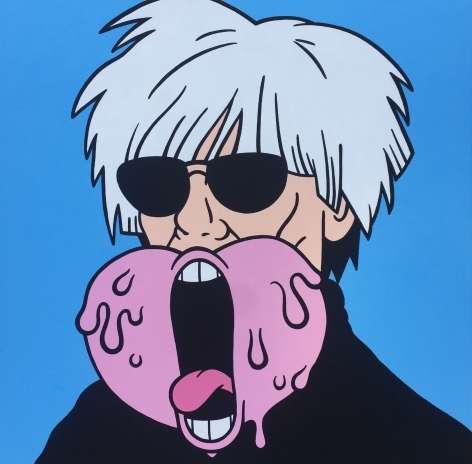 Antoine Tava makes no secret of his insatiable fondness for both Italian and American pop culture. 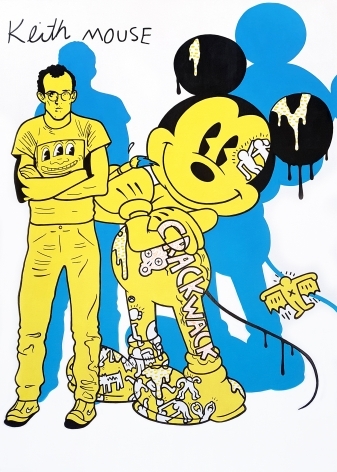 He multiplies references to the heroes of his childhood and adolescence with a blend of humor, satire and tribute. From Dubai to New York through Barcelona and Soa Paulo, his work has already been around. A Conversation between Antoine TAVA and Estelle Gervais from The Fine Print Magazine. 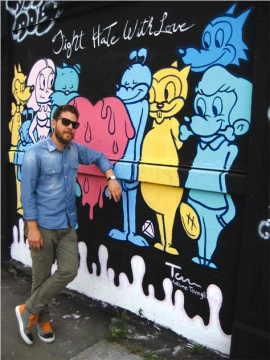 Antoine Tavaglione AKA ‘TAVA’ is a Canadian visual artist with a signature style in pop art. 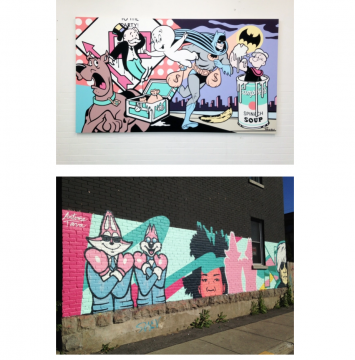 He works with various mediums, from canvas to huge murals and brand collaborations. 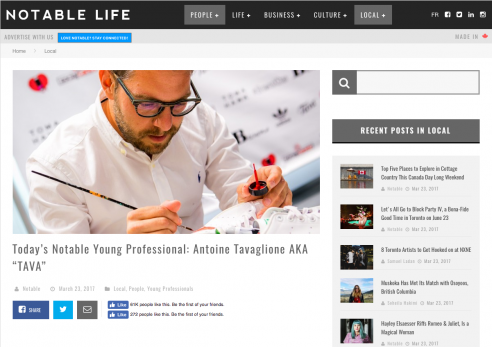 TAVA is today’s Notable Young Professional. ARTICLE IN FRENCH - En 1982, Antoine Tavaglione ne se doutait pas que le calepin et le crayon empruntés à sa nonna (grand-mère) allaient devenir ses deux principaux instruments de travail. Les heures passées à inventer des histoires, élaborer des personnages et ponctuer de couleurs sa feuille blanche auront été déterminantes pour le gamin de 3 ans. Antoine Tavaglione (aka TAVA)’s screaming hearts have become a signature visual for culturally driven Montrealers. 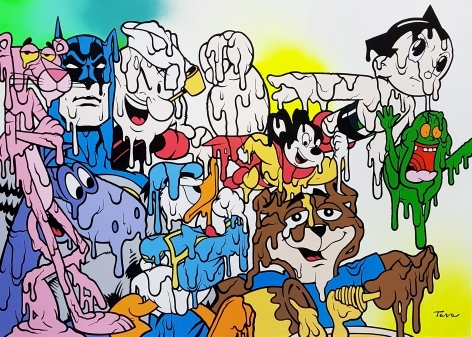 His cartoon looking figures painted in a bright pastel color palette are the key elements to his excellent pop art. He precisely hands paints all his pieces regardless of the format. He has experience painting on canvas, murals, various objects and even products such as sneakers. His collaborations with corporations such as Nike and Adidas demonstrate his popularity and success. 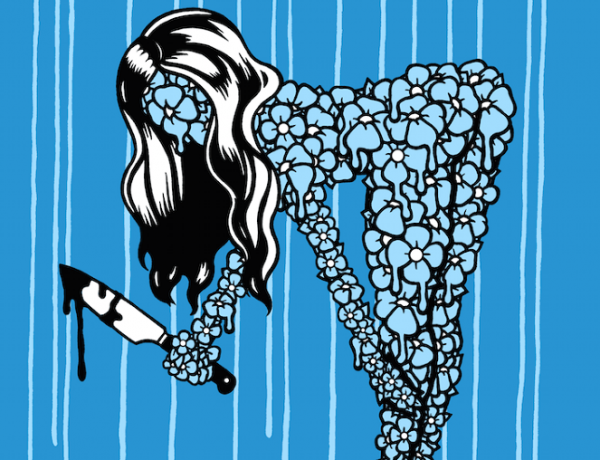 Antoine TAVA is a Montreal-based pop artist. Renown for his “dripping” visual effects, from-Dubai-to-Brooklyn recognizable “screaming heart” icon, and dope Adidas SS sneakers series, he is an obvious pick for our first artist interview! 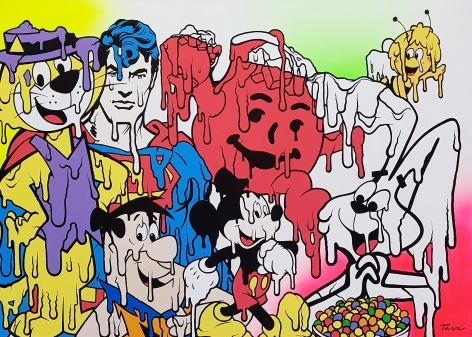 We sat down with the painter/illustrator to talk cereal, Biggie Smalls and contemporary political issues.